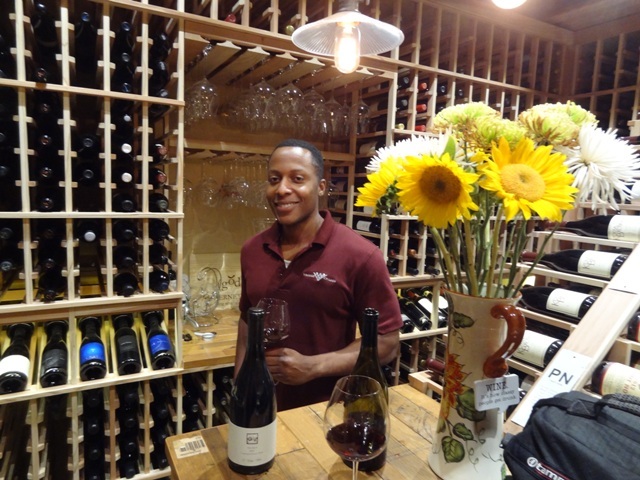 Today, we’re looking at a residential wine room located in Ramona, California designed by Vintage Cellars. 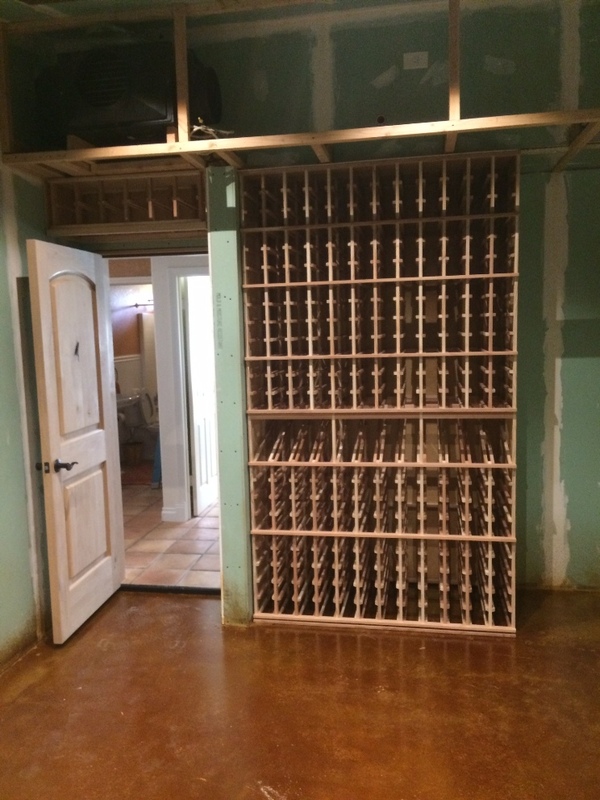 When the customer contacted us, he was looking how to convert a room in his home to build out his dream wine room. Looking at the design, we added many features, which allows for maximum storage and cleaning up display racking. 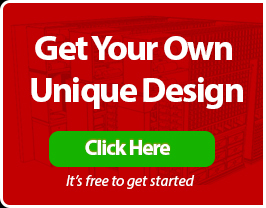 When doing a wine cellar with Vintage Cellars, we send you a CAD drawing, which allows you to see all the different features and layout of the room. The room is approximately 10x14x8 and holds around 3,300 bottles. Walking into the room, we have a bridge located above the door, which holds magnum bottles. We also have here double deep racks with double high reveal display. On the back wall, we have double sided waterfall leading down to a horizontal display wine rack, which holds magnums and a tabletop above. Behind that, we have case storage which is utilizing some of the dead space behind the waterfall. Also, in the design, we added a double high glass rack. Here, we also have horizontal display storage, which holds magnums and a high reveal display. Here’s a side view of the waterfall which comes down into a case storage which is located below the tabletop, and the end cap which is a horizontal display for magnum storage. Let’s take a look at a couple of photos of the progress in the California wine room. Here is the empty wine room here, and we had a glass window on the back wall, which we ended up removing and insulating. Here are the can lights. These are insulated can lights, which you definitely want to use in a wine room. 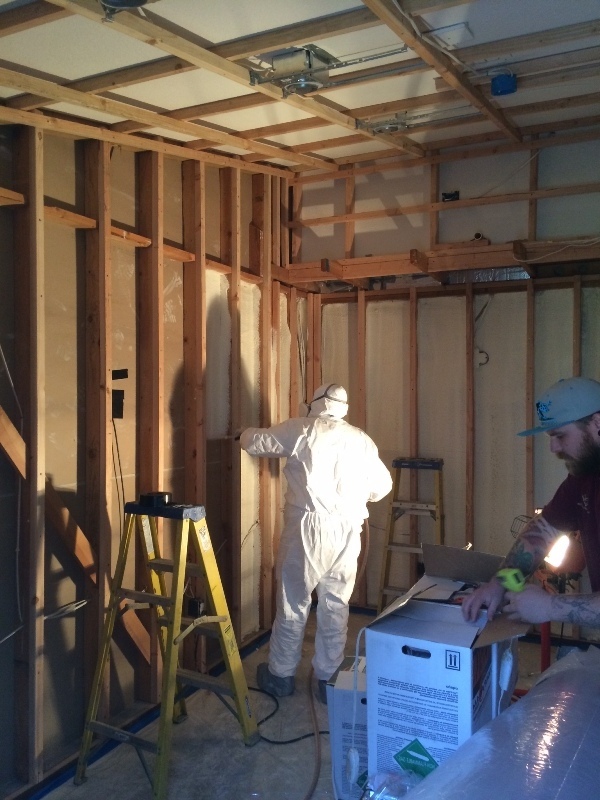 Here, we’re doing spray foam insulation, which acts as a vapor barrier well, so you don’t have to wrap the room in a 6 ml plastic. Here’s the stain on the floor. Up here, I don’t know if you could see this, but here is the air handler, which we used the Wine Guardian 1 ton split ducted system. The way the ducted systems work, is while the split ducted systems you have a compressor located outside with two lines running that’s running to the air handler, which is located either in the attic or in another room. 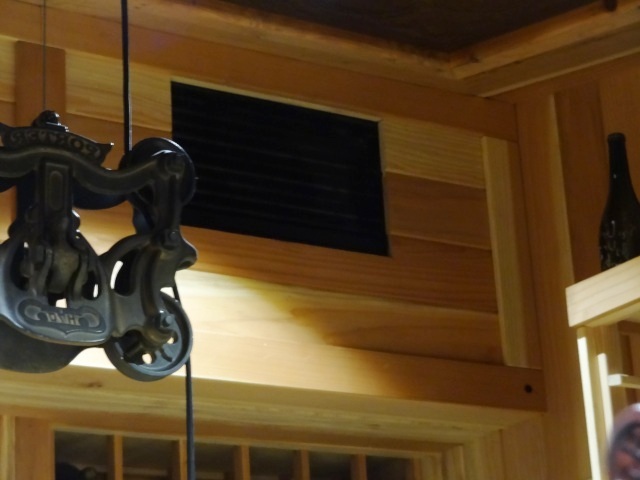 In this case, the customer put it inside the wine room, located in a soffit, which at the end, we ended covering up. Here’s a photo of the supply for the wine cooling system, and the return on the adjacent side of the room. Here is a photo of the Wine Guardian thermostat located on the wall, and the compressor located outside, which has an exterior housing to protect it from the weather, rain, snow. 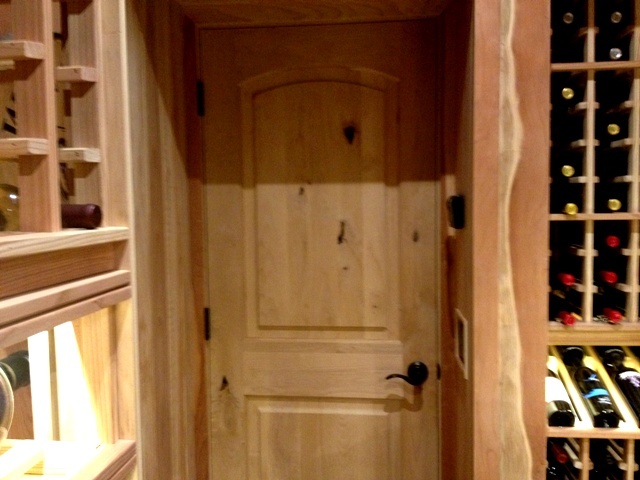 Here is a picture of the door that was used, which was Alder Wood. And here is the finished project. 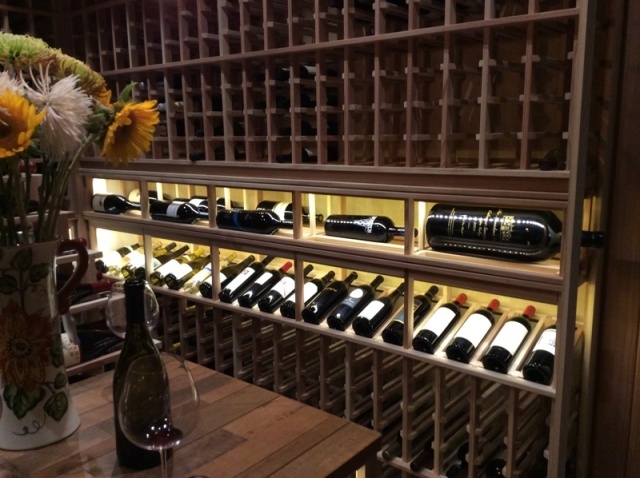 Hire a Professional on Your Next Wine Cellar Conversion Project.